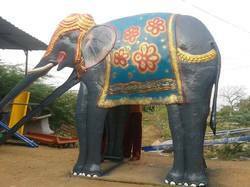 We are the leading manufacturer of FRP Animal Dustbin in Tirunelveli, Tamilnadu. We also provide in all over southIndiaincluding, Chennai, Coimbatore, Trichy, Tirunelveli, Madurai, Salem, Kanyakumari, Kerala, etc. Our clients believe on us because of our quality and service. And they know our products are worth for their money. FRP Fiber animal dustbins are long lasting, durable, UV productive, and give attractive look. 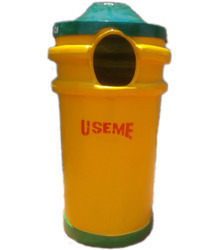 We are the leading manufacturer of FRP Pig Dustbin in tirunelveli, Tamilnadu, India. FRP 3Layer Handmade fiber Pig Dustbin suitable for all requirements standard Dimension (4 feet height x 1 1/2 feet dia approx. State of Art product very colourful & attractive. We also provide in all over south india including, Chennai, Coimbatore, Trichy, Tirunelveli, Madurai, Salem, Kanyakumari, Kerala, etc. Our clients believe on us because of our quality and service. And they know our products are worth for their money. 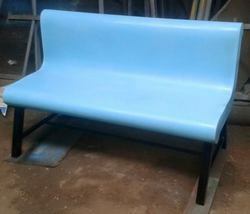 This is a standard quality FRP Sports Counter manufactured in our factory. We are located in Tirunelveli, Tamilnadu. We supply all over Tamilnadu, Kerala, Pondicherry, etc including Chennai, Trivandrum, Trichy, Coimbatore, Madurai, Tuticorin, etc. We introduce ourselves as a manufacturer of FRP Mobile Toilet . This is a standard quality FRP Mobile Toilet manufactured in our factory. We are located in Tirunelveli, Tamilnadu. We supply all over Tamilnadu, Kerala, Pondicherry, etc including Chennai, Trivandrum, Trichy, Coimbatore, Madurai, Tuticorin, Tirunelveli, Dindigul, Erode, Tiruppur, etc. 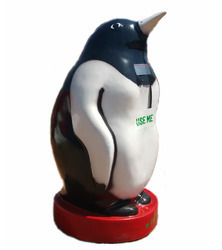 We are the leading manufacturer, exporter and supplier of FRP Penguin Dustbin in tirunelveli, Tamilnadu, India. We also provide in all over south india including, Chennai, Coimbatore, Trichy, Tirunelveli, Madurai, Salem, Kanyakumari, Kerala, etc. Our clients believe on us because of our quality and service. And they know our products are worth for their money. These are the standard quality FRP Animal Dustbins manufactured in our factory. We are located in Tirunelveli, Tamilnadu. We supply all over Tamilnadu, Kerala, Pondicherry, etc including Chennai, Trivandrum, Trichy, Coimbatore, Madurai, Tuticorin, etc. 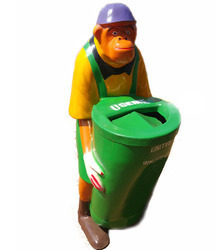 This is a standard quality FRP Dustbin - Animal Chimpanzi Dustbin manufactured in our factory. We are located in Tirunelveli, Tamilnadu. We supply all over Tamilnadu, Kerala, Pondicherry, etc including Chennai, Trivandrum, Trichy, Coimbatore, Madurai, Tuticorin, etc. This is a standard quality Dog Dustbin Made of Fiber FRP manufactured in our factory. We are located in Tirunelveli, Tamilnadu. We supply all over Tamilnadu, Kerala, Pondicherry, etc including Chennai, Trivandrum, Trichy, Coimbatore, Madurai, Tuticorin, etc. We have renowned name in the sector of manufacturing and trading an extensive range of FRP Rabbit Dustbin. Owing to the dedication of our professionals, we manufacture entire range using quality tested fiber, procured from the well-known vendors of the market. In order to meet various requirements of clients, we offer this product in various specifications. Offered product is highly acclaimed in the market for following features mentioned below. We are the foremost manufacturer and trader of an exotic range of FRP Decorative Animal. 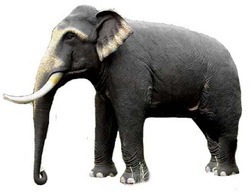 This Animal Character is manufactured using quality approved raw material by our team of skilled and knowledgeable personnel. Offered product is widely used in parks, grounds, play schools, etc. Entire range is precisely designed following the latest market trend. Clients can avail this product from us at affordable prices. We are the leading manufacturer and supplier of fiber FRP Animal and Designed Dustbins in tirunelveli, Tamilnadu, India. We are the leading manufacturer and trader of Fish Dustbin in tirunelveli, Tamilnadu, India.FRP 3 Layer Handmade fiber Fish Dustbin suitable for all requirements standard Dimension (4 feet height x 1 1/2 feet dia approx. State of Art product very colourful & attractive.We also provide in all over south india including, Chennai, Coimbatore, Trichy, Tirunelveli, Madurai, Salem, Kanyakumari, Kerala, etc. Our clients believe on us because of our quality and service. And they know our products are worth for their money. 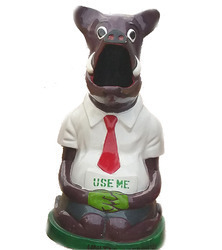 We are the leading manufacturer, trader and supplier of Frog Dustbin in tirunelveli, Tamilnadu, India. 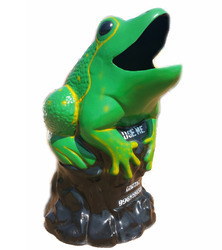 FRP 3 Layer Handmade fiber Frog Dustbin suitable for all requirements standard Dimension (4 feet height x 1 1/2 feet dia approx. State of Art product very colourful & attractive. We also provide in all over south india including, Chennai, Coimbatore, Trichy, Tirunelveli, Madurai, Salem, Kanyakumari, Kerala, etc. Our clients believe on us because of our quality and service. And they know our products are worth for their money. 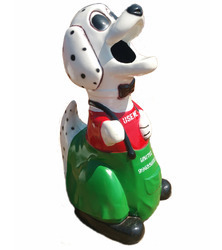 Dog Dustbin suitable for all requirements standard Dimension (4 feet height x 1 1/2 feet dia approx. State of Art product very colourful & attractive.We are the leading manufacturer and supplier of fiber FRP Animal and Designed Dustbins in tirunelveli, Tamilnadu, India. We also provide in all over south india including, Chennai, Coimbatore, Trichy, Tirunelveli, Madurai, Salem, Kanyakumari, Kerala, etc. Our clients believe on us because of our quality and service. And they know our products are worth for their money.Our esteemed clients can avail these products from us at reasonable prices. With long years of experience in the industry, we are able to manufacture and trade high quality range of FRP Tree Dustbins. These FRP dustbins are very durable, high strength and have excellent design for containing the garbage. Our FRP dustbins have excellent capacity, supreme strength and easy to maintain. These FRP dustbins are highly demanded in various places around the country for homes, offices, parks and many other establishments. Clients can avail from us our range of FRP dustbins at affordable prices. Clients can also avail from us our range of FRP Animals Statue which we manufacture and trade in wide range. Our FRP animals are very elegant, stylish and adorable looking animals that are ideal for adding decoration for different gardens and many other areas. These FRP animals have excellent shape, color and designs that are carefully crafted and designed by our highly skilled personnel. Our FRP animals are very reliable and long lasting available to our clients at very reasonable range of prices delivered on time. 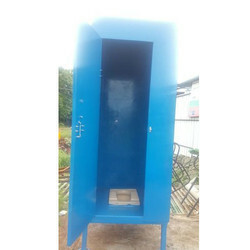 We are the leading Manufacturer and supplier of Mobile Portable Toilet. We are specialized in fiber made Mobile toilet. We have the manufacturing unit in Tirunelveli, Tamilnadu.Backed by rich industry experience, we are engaged in manufacturing and trading the best quality Mobile Toilet. Our offered product is high in quality, easy to install and requires less maintenance. Our offered product is provided with the facility for Indian or Western commode. This is weather and corrosion resistant. We also provide these in customized forms to suit the varied requirements of our clients. We are engaged in manufacturing and trading an exclusive range of FRP Shielding Security Cabin. Offered range is precisely fabricated using the best quality raw material and advanced technology under the supervision of our experts. To wipeout flaws our quality controllers make use of latest machines and technology in order to offer the clients’ perfect product. Clients can avail this product from us at unbeatable prices. 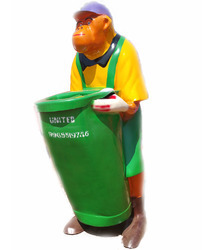 We are the leading manufacturer and supplier of FRP Monkey Dustbin made products all over south india. We have our manufacturing unit in tirunelveli, Tamilnadu.With the capacity to accumulate the garbage, these -Bin help in maintaining a hygienic environment. 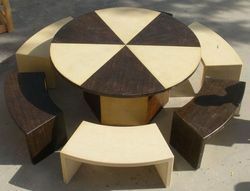 Our offered product is available in variegated designs, shapes and sizes to suit the demands of the client. We also make available this product in various colors and specifications.This -Bin is made from best grade raw-material in accordance with the global quality norms and standards.